Yep. It's my hundreth post today, and I'm kind of at a loss for words, not feeling particularly eloquent. But I was so excited about the Whiplash news, I had to say thank you and "hi" to those of you who popped on over because of it. Meet Trudy Bear, one of my finished WIPs from a couple of weeks ago. She was intended as a baby gift for a friend, but now belongs to Jessie, who rarely gets anything new and seriously suffers from BSS (Big Sister Syndrome, where the big sister takes *everything* from the baby as soon as said baby shows the tiniest bit of interest in any item whatsoever). Besides, she takes the bear and snuggles it right between her cheek and shoulder, with the sweetest little sly smile. Who could deny her anything after seeing that? 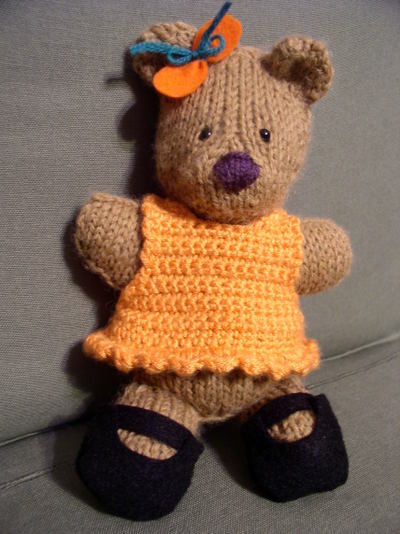 Trudy was adapted from this pattern, knit in two pieces. The dress was crocheted totally off the cuff, and the other details (shoes, bow) are felt, just roughly cut and hand sewn. It's the first time I've used safety eyes, and also the very first time an embroidered nose turned out just right on the first try. 100 posts. Socks, color, kidlets, goofy moments, confessions. Felt, pincushions, patterns, swaps, celebrations, memories. For those of you who have stopped by and stuck around, I've got to keep up with blogging tradition, so I'll pick a name from my comments at the end of the week (Friday) and send the winner this. (I would give away one of my fabric thimbles, but they've mysteriously disappeared. Sigh.) Keep coming back for more of the same, finished projects, daily life, maybe some items for sale and a tutorial or two? I think I'm gonna stick around for a while. Happy 100th - that bear is cute-a-roo! I'm having my 100th post too! Go by and sign my comments and I'll put you in MY drawing! Congratulations (on 100 AND your Whip-Lash winnings), Happy Halloween, and CUTE bear! Happy 100! Here's to many many more!! Congratulations on your 100th post! That bear is so cool! I love your knit toys, well, your toys in general. You make the neatest things!! Congratulations! 100 posts yeah! And it was very exciting to see your work over at whip up, awesome!